Shining Path: Over the past 4 decades, there have been a multitude of Committees, Reports and Recommendations with clearly laid out roadmaps supported by detailed descriptions on the kind of design and overhaul that is needed. Also, we have the SC directives on Police reforms [Prakash Singh & Others vs Union of India & Others, 2006], that could have been a starting point towards change. Yet there has been very little action – what do you think are the chief hurdles in implementation? Dr.JP: Police reforms are possibly the hardest of governance reforms to accomplish in the Indian situation. First, there is deep institutional reluctance to make rule of law real, because much of the power of the executive in a centralized, dysfunctional system is derived from the control of police. Second, ours is a system of compensatory errors. The distortions of one segment or agency of government are set right or neutralized by perversions in another agency! Therefore, there is always fear of upsetting the applecart. And finally, there is no single step which symbolizes police reform. Many inter-related reforms are needed, and an intricate web of linkages and checks and balances should be in place. Our politicians and bureaucracy have lost the capacity for patient, systematic institution building. We want a quick fix – a law or a scheme, launched with big flourish. That simply will not work anywhere. Take the Right to Education Act, for instance. Our educational delivery is among the worst in the world. But we claim to have engineered a revolution! Shining Path: Recent events in Delhi were pregnant with the possibilities of this issue being mainstreamed. Your views? Dr.JP: Not necessarily. The Delhi events are more about political drama and blame throwing. To the extent that they deal with the police administration, it is more a fight for wresting control from the Union to the UT. There is no real effort to restructure the police and make them effective instrument of rule of law. Shining Path: Coming to the specifics now, from amongst the multitude of recommendations highlighted in various reports on Police reforms, could you enumerate the five that are the most important by way of impact/effectiveness? Dr.JP: First on my list would be separating crime investigation from the other wings of police dealing with law and order. While institutional linkages between them are necessary, crime investigation is about gathering and sifting evidence, and it has to be treated as a quasi-judicial function, and should be led by an autonomous, but accountable body. Second, there should be checks and balances. An autonomous, rogue police force will be a disaster. Therefore, accountability and monitoring should be ensured by suitable institutional mechanisms. Third, there should be radical change in personnel policies. In the investigation wing, the recruitment should be only at officer level, starting with ASI; and constabulary should be recruited only for riot police, and for repetitive, monotonous tasks. The overall police-population ratio is about 130 per one lakh population, and we need to enhance it at least by 50% to meet the challenges of growing urbanization. Every district should have a forensic laboratory, and we should rely on teams and tasks, with effective mobility and communication. Women police officers need to be recruited and should at least constitute 33% new recruitment. Neighbourhood watch groups and volunteer corps should be institutionally involved to deal with patrolling, petty crime and citizen safety. Fourth, prosecution wing should be made independent. Each district should have a District Attorney drawn from judiciary, with a tenure of five years. All investigation and prosecution should be under the guidance and supervision of the DA. This will ensure autonomy, efficiency, protection of human rights and better coordination with the criminal courts. Fifth, all small crime should be handled at the local police and neighbourhood level. The crime investigation wing, equivalent of CB, CID in most states now, should not be burdened with petty crime. All such petty offences should be tried in local courts – created for at least one per 50,000 population – by summary procedure. There local courts should function as an integral part of independent justice system, but must be able to render speedy justice inexpensively. These five steps will radically and seamlessly restructure the police, and will yield dramatic outcomes. The challenge of India is to restore the culture of rule of law, and make police and justice accessible, effective and credible. The Administrative Reforms Commission gave a very practical road map. Shining Path: Police being a state subject [with exceptions], are there any states that have taken the lead – relatively speaking - on implementing the specific reform measures, which the other state governments can benchmark themselves against? Dr.JP: Not really. A few states like Maharashtra, Kerala etc have made some efforts for some time. But much of the discussion is centred around the appointment of DGP. Most states pay lip sympathy to the Supreme Court directive (click here), but have learned to kill the spirit of it. There is no single silver bullet to change the culture of policing in India. A series of well-coordinated steps are required as outlined above. Shining Path: Are there any global best practices pertaining to any aspect of Police administration that you would like to highlight? Dr.JP: There are a few important lessons to be learnt from experience elsewhere. In most advanced democracies, interference in crime investigation, and an effort to direct or influence investigation are treated as obstruction of justice, and punished severely. Nixon had to resign as the US President because his aides obstructed justice. In the UK, in the Campbell affair, the government took a partisan decision to withdraw prosecution, and it had to resign in 1924. Since then, no government or minister dared to interfere in crime investigation. We need strong legal provisions to deter politicians or bureaucrats from obstructing justice. Many countries, while giving police autonomy, made sure that there are layers of accountability. New South Wales in Australia has at least two layers of independent, effective monitoring to prevent abuse of authority. Police is the only coercive arm of the State internally, and a rogue police force would be an unmitigated disaster. Autonomy, effective accountability and prevention of abuse of the powers of life and death that police often exercise should go together. Shining Path: A transformative movement usually needs a widely respected and visible evangelist who changes the discourse on a certain issue and takes it in the direction that serves the cause the best. Do we have any such potential evangelists who can and should make it their single-point agenda to raise public consciousness on this issue across geographies and cross-sections of the population? Dr.JP: Law and order, crime investigation and police are state subjects in our constitutional scheme. Therefore one massive national movement will not help. Not can these reforms happen in one fell swoop. Detailed, intricate arrangements are needed. And we cannot suddenly erase existing structures. The good news is, urban India is demanding better policing, protection of human rights and speedy justice. Rapid urbanization is sensitizing us to the need for fair, humane and effective policing. We need a grand bargain. Judiciary, in some form should have greater legitimate say in crime investigation. Legislator should cease to function as disguised executive, and have greater say in legislation and oversight of government. The executive should regain control of policy and delivery, free from needless judicial shackles. Shining Path: Do you think the Indian mainstream media, vibrant as it is, can play a slightly more constructive role by separating signal from the cackle of white noise on important issues pertaining to systemic reforms? Dr.JP: Mark Twain said: Often a hen that only laid an egg cackles as if she has laid an asteroid. This is particularly true of this day and age, when instant gratification and hyper stimulation of the senses seem to be the norm. But I am certain that viewers and readers are increasingly going to demand from government delivery, and from media a better public discourse. As incomes rise and the young are exposed to the rest of the world, media will play a far more creative, mature role in reshaping our institutions of governance. 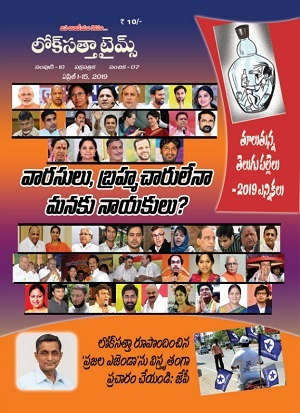 Dr. Jayaprakash Narayan (founding President, Lok Satta Party) is the MLA from Kukatpally, Hyderabad. He earlier served as a Member, National Advisory Council to Govt. of India and a Member, 2nd Administration Reforms Commission (rank of a Union Minister of State). He also served in the IAS for 17 distinguished years in various capacities including as the Secretary to both the Chief Minister and Governor. He is a physician by training. 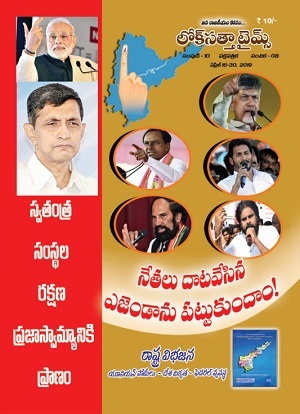 He can be contacted at: @JP_LOKSATTA [Twitter] or jp@loksattaparty.com [e-mail]. How many were implemented between 2007 to 2014 in these 7 years, please tell the details or post the details here please. Atleast they tried to put some input on the minds of the people who watches the television, that how the centralised system is working, how a c.m is incapable of ordering some things, even he was elected by people. The overall police-population ratio is about 130 per one lakh population, and we need to enhance it at least by 50% to meet the challenges of growing urbanization. How many additional people( that would have help a little bit of unemployed getting employment) were added into the police force from 2004-2014 2 terms of present government in our state, can some one give the details please?